I'm afraid I'm picture less for today's 'events' so I have taken that 'nostalgic' picture where C412 HJN is operating an extended 81 to Crafthole. Now I'm sure many of you would agree with me on this, but often the extended 81s to Crafthole and Sheviock seemed to carry no one at all. But I have already had several people asking me about whats happened to our bus service! There are now extremely few buses operating to Crafthole. In fact on a Saturday not 1 First bus operates to Crafthole, not even the late night 81Cs which used to include Crafthole. I must admit I used to get very annoied when my journey was lengthened, but for people living in Crafthole it is now a nightmare to try and get anywhere. 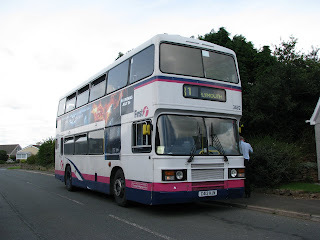 The only service that still regularly serves Crafthole is Western Greyhound's 581 (old 181). But these don't seem to be regular enough for commuters or at the right time for shoppers etc on the weekend. Not Western Greyhound's fault, they still carry plenty of passengers on the services they run, and are in line with what needs to be provided. 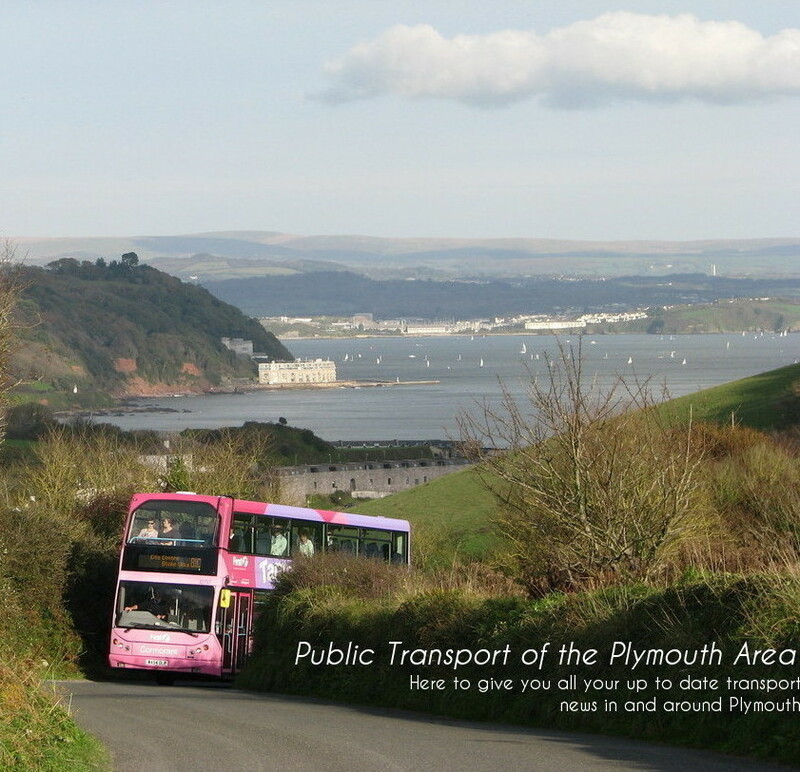 Also because the journey to Plymouth is now with 2 companies the fare has increased. Again not the fault of either company, though it is just another blow for public transport in Crafthole. 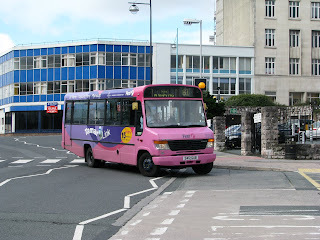 Maybe this could be an opportunity for a company to operate a shuttle type bus between Torpoint serving surrounding villages such as Sheviock, Crafthole, Portwrinkle etc. On the Torpoint school buses today, again both buses were Tridents, which were today even following each other around Millbrook. 981 was again not on the blind, but on the bus from Cremyll, James was correctly displaying "81C Torpoint Community School" so thumbs up to him. The destination was so long that it is actually in a smaller font, across 2 lines on the blind. Now I do apolgise for such a terrible picture but don't worry I have my excuses lined up! My battery charger has been playing up recently and the batterys are no where near fully charged. Infact this morning they wearn't charged at all, yet I forgot about this and proceeded with turning the camera on for this shock photo. In fear of not getting the blind showing 81A Plymouth via Devonport I put the camera onto continuous shoot mode. Sadly this continuous shooting only lasted for one picture before it died! It went off far too early, wasn't aimed correctly and even worse, the blind isn't showing! 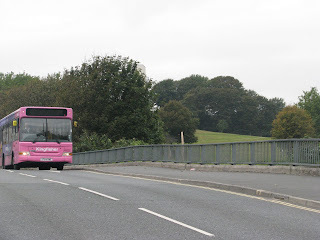 But at least you can tell that this picture shows the new 81A with Dennis Dart 40002 going across Stonehouse Bridge! The bus was full to the brim with passengers, with not a seat spare. It seems that First have definitely not thought through bus workings! 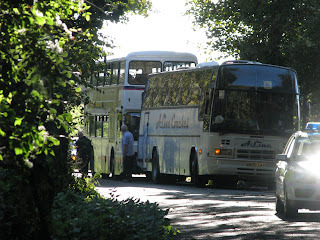 Not only this for a very busy route but down the other end of the route in Cremyll there were also problems! 981 was not yet plugged into the Trident operating is this morning. Instead there was 81 Torpoint Depot, which also was driven via Witsand Bay, where it is advertised to not go via, but go via the Poron Factory! This didn't matter before when it was a school bus, but now its a stage carridge service I'm sure there will be people who will get annoied with this quite quickly! 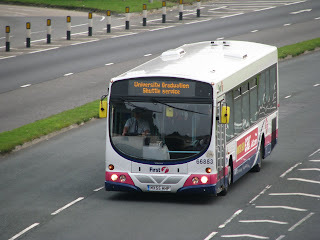 Also was the new 81C that is advertised to go via Anderton. Some idiot has booked a Trident on this working! This means that the SERVICE cannot operate via Anderton and is diverted along the normal 81C via Maker! This left many school kids stranded round Anderton without a bus! There are some severe teething problems and hopefully these will be sorted, but it is not popular so far! Another interesting thing to note is that there are no buses going to Millbrook from Cremyll between 12 and 3, all of these go straight to Cawsand! Again many people are angry about this. I've been trying to work out why this is, and I've come to the conclusion that it must be the ticket machines! They show who has got on at each destination and quite plainly no one needs or wants to get on to go on a bus to go to Plymouth from Millbrook. yet many will want to use the bus from Cremyll for Millbrook. But does this register on the ticket machines? All I know is this seems a very strange decision. I'm sure there will be much more news on these changes in the weeks to come. Hopefully along with some better photos and some correct destinations! Yesterday saw the final operations from two of the county's depots. 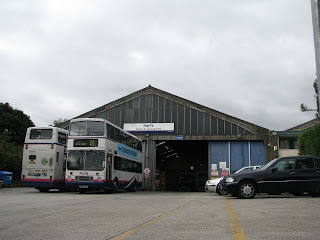 Firstly I visited St Austell yesterday morning to take my first and final look at the depot. I had heard, though operations have stopped at St Austell this depot's engineering side will continue winding down for another 2 weeks. 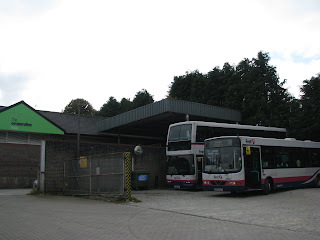 Strange to see this go as this was a well established depot with many routes running from it, though with the re-tendering process going on St Austell lost several routes to Western Greyhound and therefore was not viable to keep the depot in operation. Though even yesterday there were no fewer than 6 buses in the depot. Secondly I took the chance to ride all the way to Bude and back with Dave of VR news. 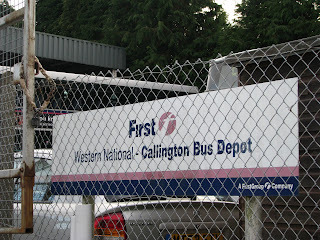 Likewise the depot at Callington where the 76 runs from closed yesterday. No winding down here though, all the buses were removed from the depot this morning, and there lays the ghost of what once was. Depot buildings are now a Co-Op and I'm sure the depot space will be a handy few extra parking places in the future! 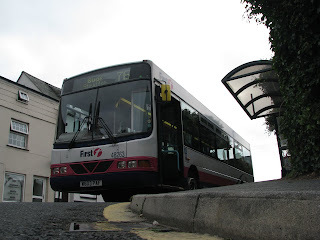 Again First has lost the 76, this now going to Western Greyhound as the 576. 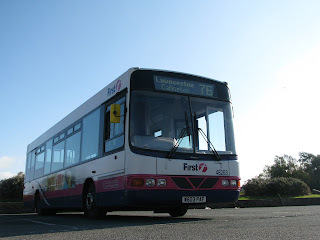 First are continuing a 76 as far as Lauceston but running from Plymouth instead. 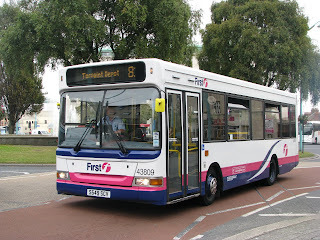 First has now withdrawn all services from Bude. 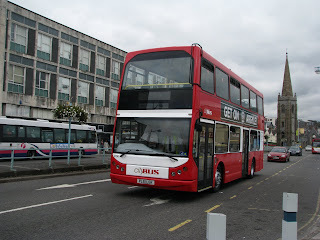 My first capture of one of the new Plymouth Citybus Volvo B7s on the road! I was going to photograph a Vario coming into the bus station, but thank god I looked behind, as this was powering down Exeter Street. I must say she did look smart, even if the livery is slightly disjointed in parts. The new Electronic blinds look very smart and I'm sure will be a great addition. It is interesting to note that this one still has the double doors, where some have been converted. I must say I particularly liked the advert on the side of 414. Whether this means filling there stomachs, or filling them better than they can fill the stadium! The seats are also waiting to be fitted, I'm guessing with brand new upholstery? 9 days to 9 months? 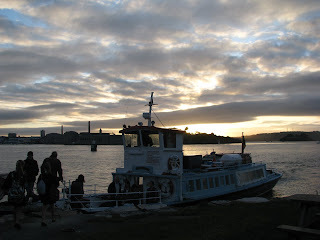 A source has informed me that that Tamar Cruising will now be operating the Cremyll Ferry for another 9 months. This has not ben confirmed yet, though there have been many complaints to the council about lack of public information on their part that has likely caused this. Good news for the Northern Belle though, this will mean she will be able to achieve 84 years in service! AS promised here is a proper picture of the new Dennis Dart MPD at Torpoint, 43809, seen here operating an 81. She does look very smart in the Barbie 3 livery, though the original moquette still remains. 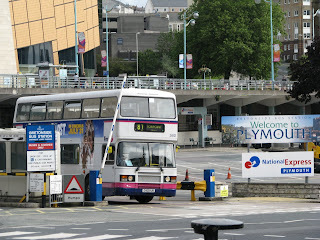 Plymouth is fast gaining Volvo B7s from Manchester, not to replace the older fleet, but simply to add to the fleet for the new services. 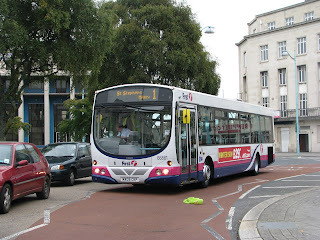 These buses will be used against Plymouth Citybus, so their reasoning is newer bus, therefore passengers will use them. 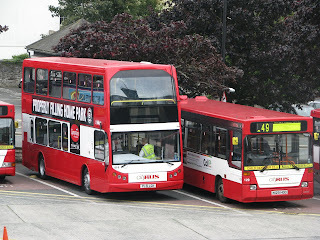 But on routes such as the 43 and 21/51 Plymouth Citybus are using even newer/same age Mercedes Citaros, which are really, that bit nicer than the B7s! But Ohh well! Bus services were disrupted after 4:00 today after an incident on the road coming out of Cremyll. A van was traveling out of the village. 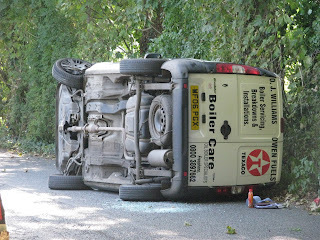 By the looks of the scene he swerved to avoid something went up the bank onto the wall and flipped the van, while flinging it across the road. The driver had a nasty cut right the way up his arm, but other than that he was ok. There were no other cars present at the time, though no doubt there will be an investigation into the incident. Steve managed to squeeze Bertie past the debree on the way down to Cremyll, though when the Ambulence was in attedence then this proved too tight to get the bus through. Ellie (E920 EAY) was also stuck the other side, unable to turn around, along with K803 ORL, and was later also joined by S764 RNE. All three were unable to get by or reverse soo looked like they may be there for some time to come before the van could be moved. I will feed you informaiton when it comes avalible. 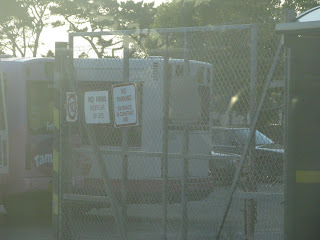 Sorry its not the greatest picture in the world but here is the new bus parked up in Torpoint yesterday. 40002 still seems to be the Dart of choise among the Torpoint drivers. Every duty normally covered by a Dart has been 40002 over the last week, including today! Hopefully will catch it in service in the near future. Well for one short trip anyway! On the way back from the Kingsbridge rally which I shall report about on a later date, we saw K801 ORL rolling down the road behind this Scania tow truck! Did you ever see one of the Leylands in this position? I think not! "Just seen 34812 and 34813 heading for the A38 at Marsh Mills roundabout. Obviously being collected by that Essex bus group. Blinds were set to 812 and 813. Oh its sad to see them go :("
It did come to a shock to me to see that the group has bought both of the sister. Yes lovely to have a matching pair but my worst fear is that one of them may be used for spares! It must have been quite a sight seeing them parade off in such a fashion. This may have been the last ever glimpse of the sisters in Plymouth forever. However much I'd love them to return down here for the Plymouth Hoe Rally I very much doubt they would bring them all the way down here. The Essex girls are going 'home'. I must say though as a last note I'd hate to think how long it will take them to get all the way back up to Essex. Especially for C413! I am currently in the process of uploading all of my Leyland Olympian pictures to flickr and will notify you when this is completed. This weeks Snap on Sunday is from my recent holiday in Hastings! I have yet to do a write up but if I'm honest there isn't much worth talking about, so I may aswell do it here! 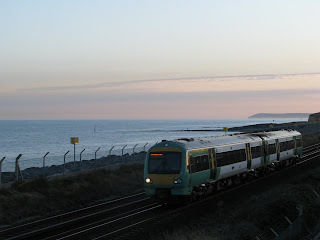 Picture is of a Class 171 operated by Southern, this being the main operator. The 171s are the only type that still use the diesel power in the area, as the line is electrified. I had a couple of rides but I couldn't stand much more, the seats are rock hard, along with them seeming fairly unstable, infact I think I prefer the ride on a 142! Bus wise again there's not really any 'gems' so to speak. 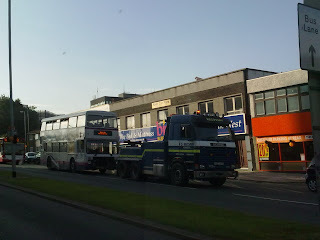 Infact Stagecoach operate the very same batch of Leyland Olympians that they do in Devon, these being the N-LPNs! Other than that, a few newer Solos, mostly 08 and 58 reg. 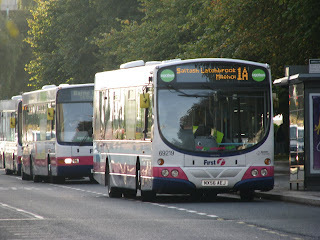 And along with some Scania Enviro 400s operating the 'Wave'. Darts are the mainstay of Renown Travel, although they do operate some 10+ Leyland Olympians, none of these are used in daily service. 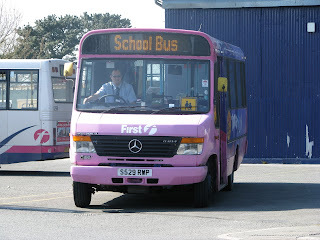 Amazingly both of the Ex-Torpoint Mercedes Varios have now entered preservation!! S412 GUB was aquired by the WNPG, for only £1 and will be used as a spare bus if one of the VRs can't attend, so at least there will be presence there even in the form of a Tamar Link Vario. S529 RWP is now in the capible hands of someone who isn't Terry Partridge, though this will be much more of a frontline preserved vehicle, working along with the likes of Bristol LHs and SUSs. S529 will make her first apearence at the Kingsbridge 7'6 running day in just a week and a half's time! Shame that it couldn't have been 2 Olympians saved, rather than Varios though!